Most individuals have a set morning routine, and part of that routine involves a cup of coffee. Staying focused is critical for any business professional, and many drink coffee to help them focus. While it is part of your routine (and possibly morning addiction), have you ever stopped and wondered if that caffeine boost in the morning was doing what you thought? It is true that a cup of coffee wakes you up in the morning, and it could keep you alert all day long, but decoding the chemistry behind it is equally critical; especially if you want to cut out coffee at work, but still sharpen your focus. Per Business Insider, when you sleep, your brain’s concentration of adenosine naturally reduces. However, the more adenosine you have present, the sleepier you feel. When you drink your morning cup of coffee, caffeine mimics adenosine. The caffeine cells overtake your brain and fill the spots of your brain where adenosine (the sleep-inducing cells) would rest. When there is nowhere for adenosine to go, there is no buildup, and you feel more awake. However, there is one big caveat to it all. While caffeine does its job and replaces the cells that make you sleepy, when adenosine has nowhere to go, the body naturally creates more receptors for the adenosine. In return, you will need more caffeine throughout the day to combat the adenosine trying to find its way back in. The additional receptacles are a principal reason why going without your morning java causes withdrawal, and you may feel more tired than you ever have before until your body balances out the adenosine and other receptors. Caffeine naturally energizes the body, and as a result, you are alert and can focus with ease. However, caffeine’s effects are short-lived. Your body and brain cells respond to caffeine, but the more you use, the more your body gets used to those signals. This is known as attenuation. Therefore, less is more with caffeine – which includes sodas, coffee, chocolate, and other sources of caffeine. Caffeine is often labeled as an addiction, but it does not create the same addiction affects as other substances. Instead, your brain’s chemistry begins to adjust to the caffeine. So, while you go through withdrawal symptoms, it subsides once the brain chemistry balances back out. That morning coffee at work lasts in your blood and tissue about 45 minutes after being consumed and then lasts about four hours. The half-life is shortened to three hours if you are a smoker. 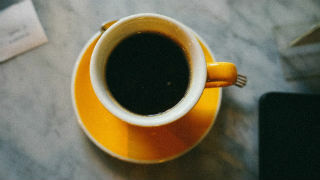 Caffeine is found in numerous sources, including decaf coffee. However, decaf coffee has a minuscule amount of caffeine. Other sources of caffeine include chocolate, non-cola sodas, certain ice creams, weight loss pills, some pain-relieving medications, energy water and drinks, breath fresheners, nut mixes, and some brands of oatmeal. Do you use caffeine for staying focused in your business? Share other ways you help hone in on the job and get it done.